Barbara Parramore, professor emerita in the College of Education, served more than 40 years in public education, working as a teacher, school counselor and principal followed by 26 years as a professor and administrator at NC State. She holds an undergraduate degree from UNC-Greensboro; a master’s degree from NC State; and a doctorate of education from Duke University. Parramore researched early childhood education for the 1968 Governor’s Study Commission and wrote the report that supported the establishment of kindergartens in North Carolina. She began her NC State career in 1968 and became the founding head of the Department of Curriculum and Instruction in 1975. She was the second woman to head an academic department at NC State. Interested in education policy, Parramore served as president of the N.C. Association of Supervision and Curriculum Development in the 1980s. Later, she participated in curriculum audits of N.C. school districts. 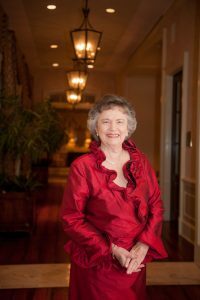 In 1994, Parramore became the first woman to receive the Holladay Medal of Excellence, the highest faculty honor awarded by the NC State Board of Trustees. Her publications include academic articles, book chapters and instructional materials, including textbooks and teachers’ guides. She volunteers with the Umstead Coalition and Carolina Ballet and served on the Centennial 4-H Committee. Parramore received the 2014 William C. Friday Award for Distinguished Service in Retirement from the Association of Retired Faculty. Dean Mary Ann Danowitz says: Barbara has been a tireless advocate for education and a highly valued member of the NC State, College of Education and Raleigh communities. While on faculty, she was admired and respected for her entrepreneurial approach to challenges, big and small. In retirement, she has been just as committed and productive in her volunteer roles. Her energy and drive are simply unrivaled. It is so appropriate that the NC State College of Education Distinguished Alumni Award will be added to her list of accolades.